Grandma's favorite old fashioned donut recipes make the best donuts imaginable. You must simply try them! So fresh and crispy! They taste so much better than the store-bought kind when homemade. Why not get the family together and make donuts tonight? You can always substitute your favorite oil for the lard, but lard or fat does lend its old time flavor. 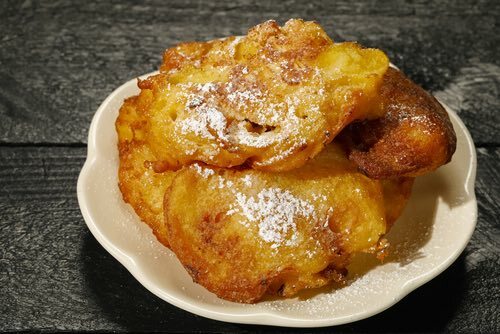 Success in making a good fried donut depends as much on the cooking as the mixing. In the first place, there should be boiling lard enough to free them from the bottom of the kettle, so that they swim on the top, and the lard should never be so hot as to smoke or so cool as not to be at the boiling point; if it is, they soak grease and are spoiled. If it is at the right heat, the donuts will in about ten minutes be of a delicate brown outside and nicely cooked inside. Try the fat by dropping a bit of the dough in first; if it is right, the fat will boil up when it is dropped in. They should be turned over almost constantly, which causes them to rise and brown evenly. Wooden skewers come in handy for turning donuts in the hot fat. When they are sufficiently cooked, raise them from the hot fat and drain them on a wire rack until every drop ceases dripping. This old fashioned recipe is taken from an old Canadian newspaper clipping found in Mom's scrapbook. Homemade donut recipes such as this were quite popular in many kitchens in the early 1900s. One egg, one cup of sugar, two tablespoons of butter, beaten together till creamy. Add one cup of sweet milk, a pinch of salt, two teaspoons of baking powder stirred into two cups of flour. Add one-half teaspoon of ginger and one-fourth teaspoon of nutmeg to the flour. Beat well, roll out about one-fourth of an inch thick. Cut out all the cakes before beginning to fry. Cook in deep fat that will fry a small walnut-sized ball of the dough in about sixty-five seconds. Do not let the fat get above that degree of heat. Just imagine... The old fashioned donuts below were once made and served at the White House to be eaten and enjoyed by Presidents! One pint of milk, four eggs, one small tablespoonful of melted butter, flavoring, salt to taste; first boil the milk and pour it, while hot, over a pint of flour; beat it very smooth and when it is cool have ready the yolks of the eggs well beaten; add them to the milk and flour, beaten well into it, then add the well-beaten whites; then, lastly, add the salt and as much more flour as will make the whole into a soft dough. Flour your board, turn your dough upon it, roll it in pieces as thick as your finger and turn them in the form of a ring; cook in plenty of boiling lard. A nice breakfast cake with coffee. This old fashioned dessert recipe makes a tasty treat similar to what many of us now call Donut Holes. You will enjoy trying this! 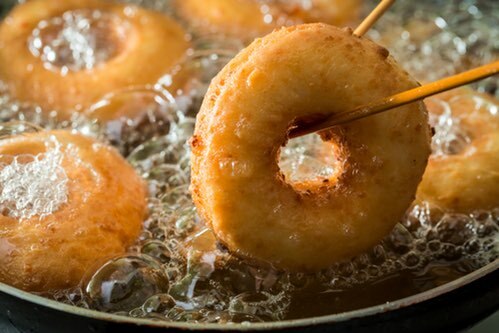 These donuts, eaten fresh and warm, are a delicious breakfast dish and are quickly made. Three eggs, one cupful of sugar, a pint of sweet milk, salt, nutmeg and flour enough to permit the spoon to stand upright in the mixture; add two heaping teaspoonfuls of baking powder to the flour; beat all until very light. Drop dough by the dessertspoonful into boiling lard. These will not absorb a bit of fat and are not at all rich, and consequently are the least injurious of this kind of cakes. Work one egg and a tablespoonful of sugar to as much flour as will make a stiff paste; roll it as thin as a dollar piece and cut it into small round or square cakes; drop two or three at a time into the boiling lard; when they rise to the surface and turn over they are done; take them out with a skimmer and lay them on an inverted sieve to drain. When served for dessert or supper put a spoonful of jelly on each. So good! 1 cup sugar; 1 cup mashed potatoes; 1 cup sweet milk; 4 eggs; 4 teaspoons baking powder; 3 cups flour. Mix thoroughly then add flour enough to make stiff dough. Do not separate eggs; beat with sugar then add potatoes. Put a teaspoon vinegar in frying fat. —Mrs. Delia Hughes, Seal Beach, Calif.
A quart flour, a cup sugar, two tablespoons melted butter, a little salt, two teaspoons baking powder, one egg, and sweet milk sufficient to make rather stiff; roll out in thin sheets, cut in pieces about two by four inches; make as many cuts across the short way as possible, inserting the knife near one edge and ending the cut just before reaching the other. Here's an idea for a donut-style treat. Use your favorite homemade donut recipe, but instead of cutting donut shapes, take bits of the dough and wrap them around pieces of fruit. Apple slices and berries are totally delicious inside a fruity fried donut! I can recall my mother making donuts with these vintage recipes when I was a young boy. It was always fascinating to watch them swimming and bobbing about in the hot bubbling fat, turning a crispy golden brown right before my eyes. Now, you can share the experience with your children. Everyone wants to help when you make them, but watch out for the little ones when they are around the deep fryer. You don't want them to get splashed by the hot oil. Yes, you can substitute your favorite oil for the lard if you prefer. However, the fat (lard) does lend its distinctive old time taste. Homemade donuts are delicious to eat on any occasion. They always go good with a morning coffee! And while they do take some time to prepare and deep fry, all that's forgotten once you experience the amazing homemade taste. 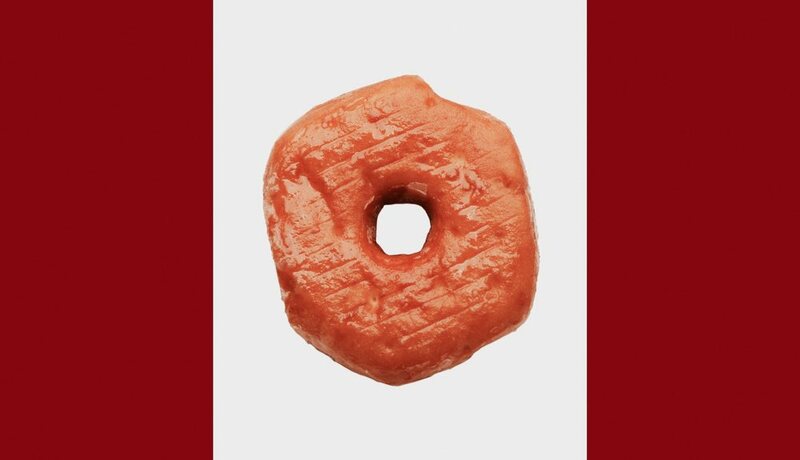 The Great Canadian Donut, Eh! Donuts are immensely popular throughout the world, and Americans consume the most. Dunkin' Donuts® and Krispy Kreme Doughnuts® are the most popular brands sold in the United States, and billions are sold each year. However, did you know that Tim Hortons®, the main donut franchise in Canada, is reported to have over four times as many outlets "per capita" than its American counterparts? That's because Canadians are known to eat more donuts than anybody in the world — three times as many per capita than our American neighbors! We Canadians are nuts about donuts! In most cities, you are never more than four or five blocks from a donut shop, they've become a social gathering place — an institution! For many Canadians, it has become a daily ritual to enjoy coffee and donuts at Tim's while reading the newspaper, meeting clients, or while doing one's homework. It's where we meet with friends. 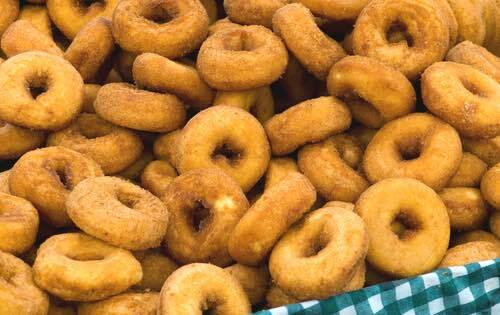 I can share from experience, however, the donuts made from these vintage recipes taste better than any you can buy. And, they cost you less too! You are sure to find a favorite in this collection of homemade donut recipes. Are you ready? Have fun making a batch today. Your family and friends will be impressed, and you will enjoy a delicious homemade treat.